The band had this to say! 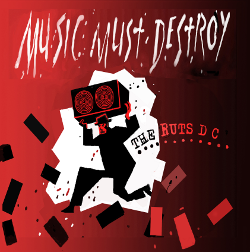 RUTS DC are very pleased to announce that they have signed a deal with Westworld Recordings to Licence and distribute their forthcoming album Music Must Destroy. “We have worked very hard on our own SOSUMI RECORDINGS label and Westworld are happy for us to keep that identity.” Says Segs from the band “They want to help us to get our music out there so that people actually know it’s been released! In the ever changing world that was called ‘The music business’, we feel that Westworld are embracing the new way forward “. Westworld is distributed worldwide by Plastic Head Distribution. 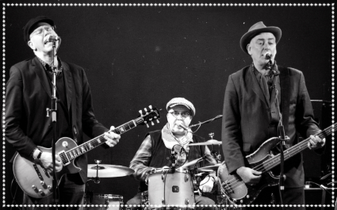 The Ruts formed as a reggae in­ uenced UK punk band in 1977. The band released six singles, the second of which, “Babylon’s Burning” reached No 7 in the UK singles chart, and 2 albums The Crack and Grin and Bear it. After the tragic death of singer Malcolm Owen, the remaining original members - Paul Fox (Guitar), Segs Jennings (bass) and David Ruffy (drums) - continued performing and releasing records as a trio, adding the musical term D.C. to the name. Despite critical acclaim the band folded in 1982 only performing 1 more gig in 2007 with U.S. punk hero Henry Rollins on vocals (Rollins describes “The Crack“ as “The best album ever made”). This gig rightly made punk rock history. Sounding fresh in 2016, Ruts DC add the ­ uidity of reggae to the toughness of punk, the now legendary, rhythm section of Segs and Ruffy allowing Leigh Heggarty to excel on guitar as Segs handles lead vocal duties with panache and respect. They are considered to be one of the very best of the original UK punk bands still performing, touring extensively and performing at the last three Rebellion festivals Ruts DC visited Australia and New Zealand for the first time in November 2015, performing the songs that are still proving to carry an important message in these current times.